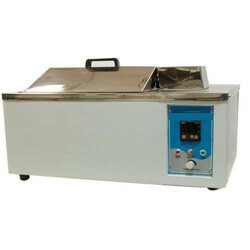 Pioneers in the industry, we offer bod incubator, bacteriological incubator, orbital shaker heating incubator and water bath metabolic shaking incubator from India. Inner Chamber made of SS 304. 75 mm gap between outer and inner chamber is insulated with high efficiency mineral wool. Fitted with tow Air Criculation fans for uniformity of the Temp. Controlled by Micro Processor Elect. Digital Temp. Controller. Full view inner glass door for inspection of samples. CFC free Refrigeration system fitted with EMERSON Compressor. Inulates door has viewing window. 75mm gap between outer & inner wall is insulated with high efficiency Mineral Wool. Temperature controlled by thermostat/Digital Temp. Contoller with air circulation (option) for an accuracy of +- 0.5 C.
Outer body made of MS duly Powder Coated / SS 304. Inner Chamber made of SS 304 with Air Circulation Fans. Temp Controlled by Digital Temp. Controller. 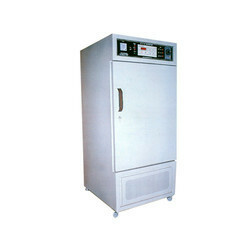 Shaker is fitted with Variable speed PMDC Drive and Digital RPM Meter. Shaker is fitted with SS Platform and SS Lotus clamps to hold the flasks. 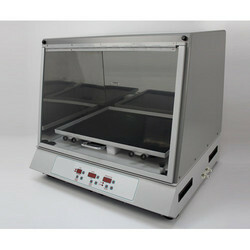 Fitted with Chest type Plexi glass (Acrylic) Dome which allows inspection of samples without disturbing the temp. Suitable to Accommodate 16 Flasks of 250 / 500 ml or 36 Flasks of 100 ml. 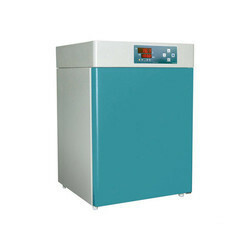 Looking for Industrial Incubator ?